We all love a good food hype, right? 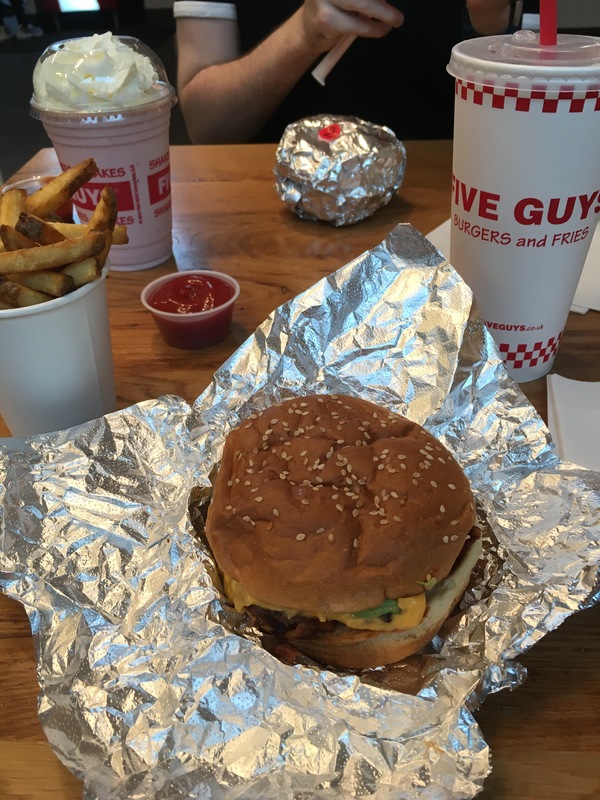 Well I’m small-town (relatively), and with the exception of on occasional trips to London, I’ve always been miles and miles from one of the latest hypes from the last year or two: Five Guys. Yep, that’s right, I’ve only just been for the first time. 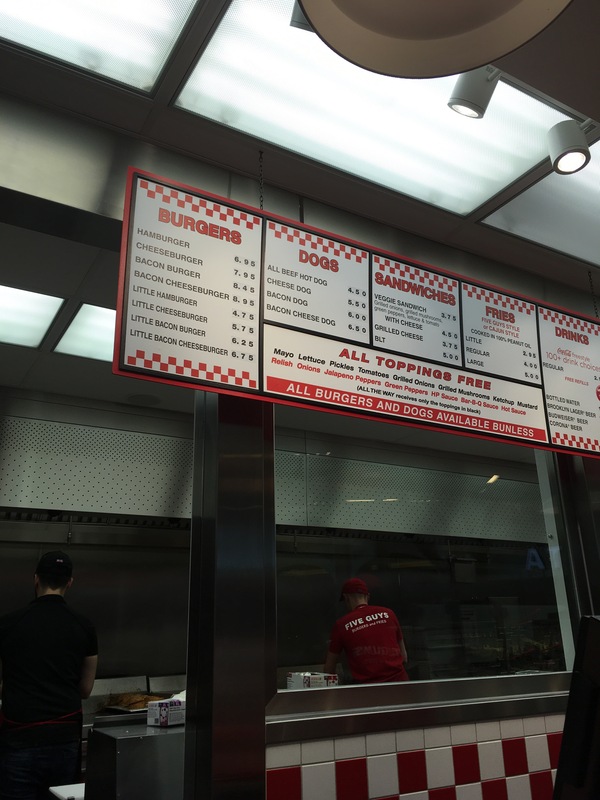 However, on our trip to Manchester last weekend, Matthew promised to take me for my first ever Five Guys at the Trafford Centre, and it went a little something like this..
First up, Matthew advised me to order the ‘little’ options on the menu, so I chose a little bacon cheeseburger and a little fries. 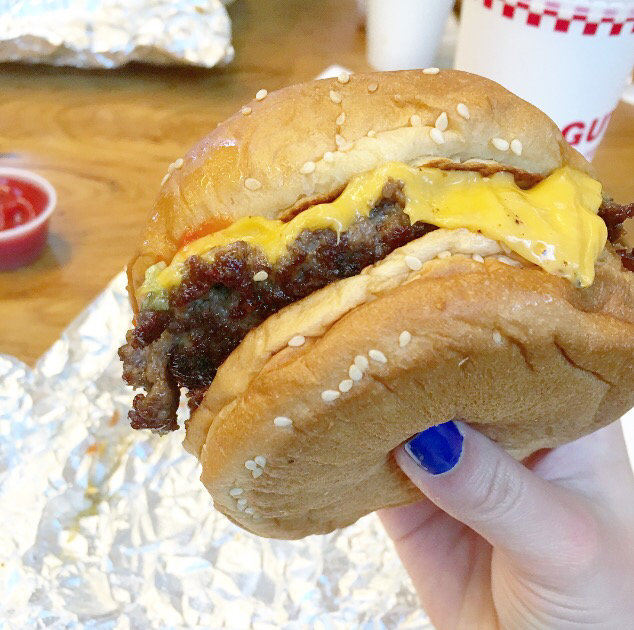 Now I’m not a fussy eater, but I often find that in most burger places I end up picking out half of the junk they stuff into the bun, so when I realised that I got to choose exactly what went into my burger, it made my little heart so happy! There are 15 different extras available, from lettuce, onions and tomato to different sauces, so you can build the exact burger that you want without the worry of pickles hidden under the cheese or looking like a fuss-pot when you deconstruct your burger just to remove that pesky tomato. Goodbye unnecessary food waste! Drink-wise, I had to go for the refillable Coke machine option, and I swear my mission in life from now is to try as many different combinations of fizzy drinks as I possibly can. I settled on a peach flavoured Sprite, quite honestly because I love anything peach flavoured, but it was delicious and I 100% feel like it should be offered as a standard Sprite flavour.. The wait for the food to be ready was a little longer than some fast-food places, but I’ve waited longer in McDonalds at times, and trust me when I say its well worth it. A brown paper bag and foil wrapped burger may seem humble as its passed over the counter, but don’t be fooled by a plain appearance. It was so nice to eat a burger that not only was perfect in terms of its contents, but the bun didn’t go soggy or disintegrate in the time it took me to eat it, and the fries weren’t cold by the time I got to them. While its a little pricier than a Maccys or BK, I’ve paid more for burgers I’ve liked less, and compared to these ‘gourmet’ burger places out there, I’d say my little bacon cheeseburger shone out above these. Not a single chip was soggy, or burnt, and they too were delicious. Also, despite all my portion sizes being ‘little’, I was STUFFED at the end of it, and actually left some fries behind because I couldn’t manage them all. 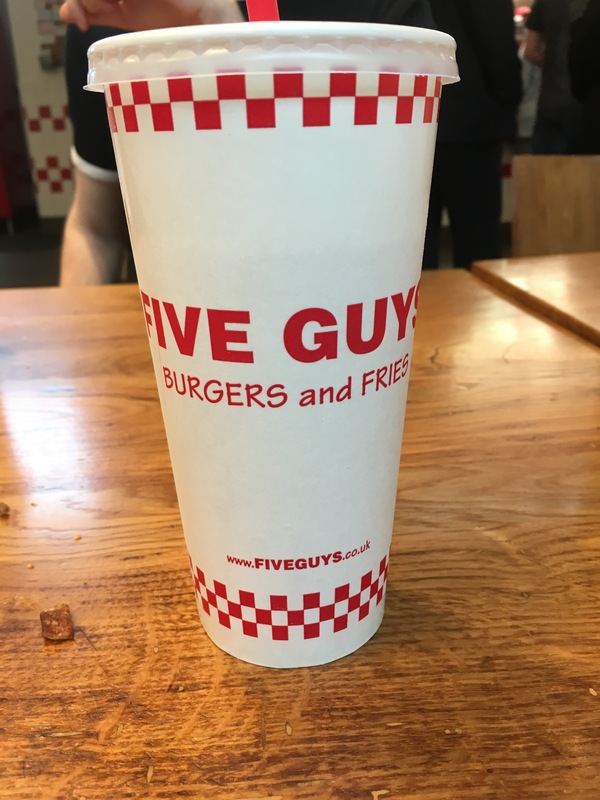 I’m not gonna lie, I actually haven’t stopped thinking about Five Guys since, and now I have to wait an agonising few months because Five Guys is coming to Bournemouth, but not until the summer, waaa! However I’ve heard a rumour that they’ll be on Deliveroo when they do open, so that could get dangerous.. Also I’m dying to try one of their milkshakes! I can’t wait for another brown bag of burger goodness, bring on the Bournemouth opening! Once again, the movie gods saved all the major films to the end of the year, and in my eyes, the whole of 2016 has been leading up to the moment that I got to see ‘A long time ago in a galaxy far, far away..’ on the big screen once more. Not seen it yet? Don’t worry, there are no spoilers here! So I decided that I liked the opening how it was, but I kinda really wanted that theme tune blaring out..
Is this Poe’s Mexican cousin? Do I like him though? What’s this, another desert-ish planet? Surprise surprise, there’s sand again.. There are a lot of names flying around, and I’m not entirely sure who’s is who right now.. Were R2 and C-3PO really necessary? I am one with the force, the force is with me. I am one with the force, the force is with me.. I loved it, I really did. I’m so glad I didn’t watch any of the trailers for it as I wanted to go in with a totally open mind, and I think that was for the best. I’m also really happy that they didn’t keep it too Star Wars – the soundtrack was perfect and the casting was spot on as always, just with its own little unique quirks. I think if I could say one bad thing about the movie, its that I don’t really think its suitable for children as much as the other Star Wars films, which is a shame as a new generation of Star Wars lovers was created last year, and I imagine a lot of children would be wanting to see this film as a result, but without spoiling it, I’d probably advise that parents see it first before taking small children! Its the movie Potter fans have been waiting for; a prequel like no other. 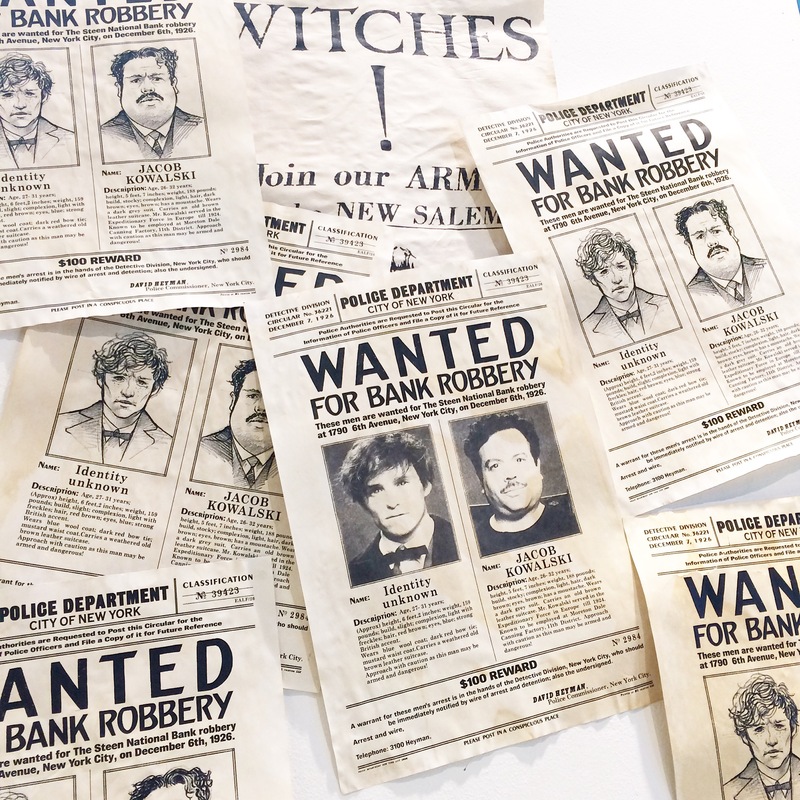 Like any good Hufflepuff, I was pretty excited to see my house being represented well, and apparated down to the cinema on the day the film was released, and here are a few of the things that I thought made this movie properly magical – don’t worry, its spoiler free! While my excitement for this movie came from my love of the Harry Potter, this film felt nothing like a classic Potter. You know how when you get sequels/prequels that are set in totally different times, one of the writers decides to put in a bunch of references to an original character that isn’t really necessary and you know they’re just trying and failing to be ‘relevant’? Nope, there was none of that and it was fab. He just plays the part so well. A number of actors could have produced a number of different portrayals of Newt, but boy does Eddie hit the nail on the head! With technology as it is these days, its easy for film makers to fall into the trap of overdoing their special effects, which results in unnecessary and unrealistic scenes, but while this film is packed with magical moments, at no point so any of these spells look out of place. Its quite easy to fall in love with adorable creatures in films, but when they’re also magical and full of personality, I defy anyone not to walk out of the cinema not wanting a niffler. You’ll laugh, you’ll cry, you’ll gasp out loud.. You’ll love every second of it. Have you seen it yet? Let me know what you thought!